Yet it died after a short production run, and drove many of its first owners to distraction. The Stag was BL’s nearly car – it nearly had the armoury to take over the world, had it not been for that fragile engine. It was early in 1964 when Giovanni Michelotti asked Triumph design chief, Harry Webster, whether it would be possible possible for the company to donate a used example of the recently-launched Triumph 2000. The reason for this request was simple – Michelotti wanted to produce a glamorous one-off motor show special and use it as a showcase for the emerging designer’s talents. Given the relationship between the Michelotti and Triumph was rock solid by this time, Webster said that he would gladly hand over one of the company’s race support cars after it had finished with the car. 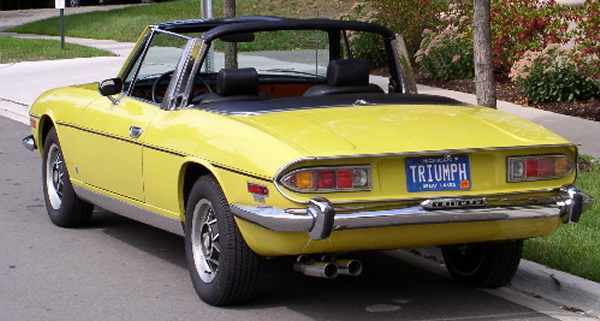 There was a proviso, though: if Triumph liked the design, then it would have first refusal on putting it into production. 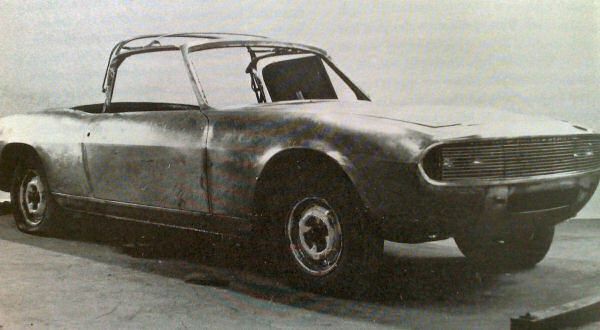 In June of that year, Triumph duly delivered its 2000 following the Le Mans 24-Hour race – and now it was up to Michelotti exercise his creative talents. The car Michelotti produced was based on a shortened version of the 2000’s floorpan. The main difference was that the convertible had several inches cut from the wheelbase in order to give the car more balanced proportions. The engine, gearbox and suspension were stock Triumph 2000 items – and had already seen plenty of action in their former life as a race support car. 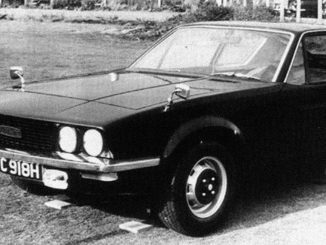 The concept car’s frontal styling was certainly a departure from Michelotti’s then current line-up but, in time, the look would emerge to become the family ‘face’ of Triumph. 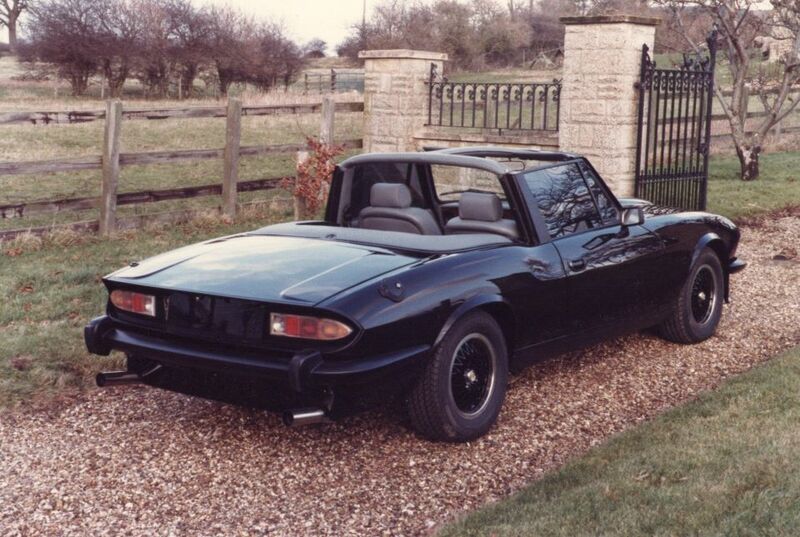 Needless to say, the handsome two-seater convertible easily won over Webster – and the project was taken over by Triumph for a full in-house development programme. 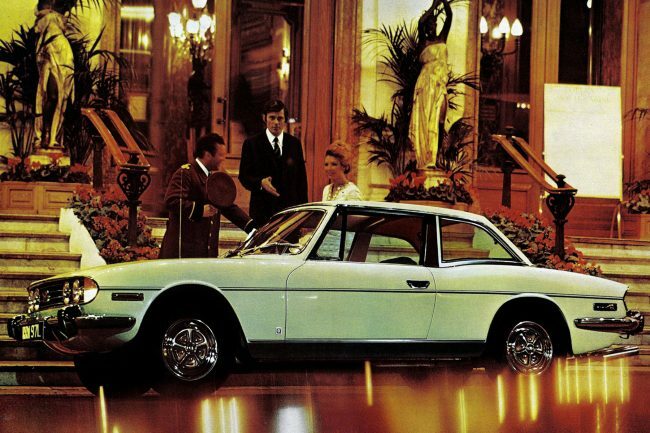 Michelotti was never even given the opportunity to publicly show the car at the Turin Motor Show, such was Triumph’s keenness to keep the stylish car to itself. 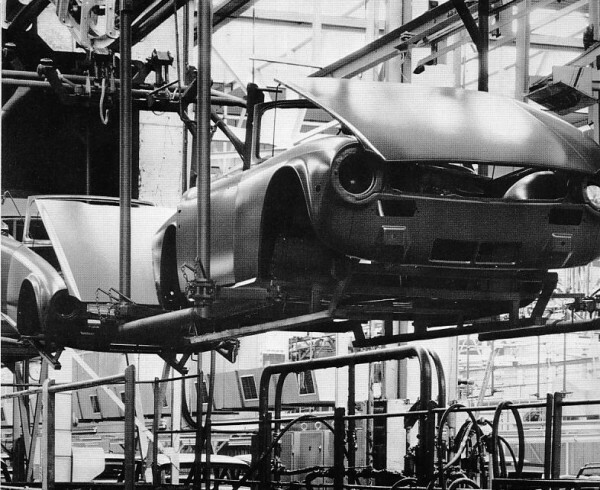 Early in 1966, work on the car began at Triumph’s headquarters in Canley, under the project name, ‘Stag’. The reason for the delay between Triumph grabbing the car and the development programme getting underway was because of Canley’s limited resources. Shored up by the success of the 2000, Webster eventually convinced upper management that Project Stag would be the ideal vehicle on which to base an aggressive expansion of exports to the USA. Originally, the Stag was designed to use the 2.0-litre straight-six engine in TS tune, but this plan was soon succeeded by one which involved the use of the 2.5-litre version of the straight-six. Several prototypes were built using this layout, but the company’s future engine plans were still somewhat in flux, and so the Stag’s engine situation changed pretty regularly. Back in 1963, Lewis Dawtry, a distinguished member of the Triumph engineering team, drew up a report that laid out how he viewed the direction that Triumph’s engine range should go. 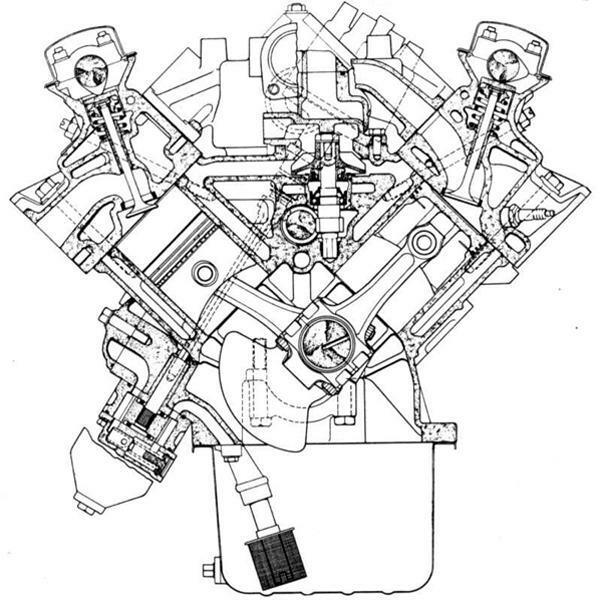 In it, he stated that the engine family should consist of only two engines: one, a slant-four of 1500cc, which should provide the potential of enlargement to 2.0-litres – and the other, a small V8 that, essentially, was created by joining two of these engines together, sharing a common crankshaft. It was around this programme that the Stag needed to fit. So, the initial development of the car was centred around the straight-six, to be used in the 2500, with future variations to be based on the upcoming V8. Webster was also adamant that in order to succeed in the USA, the straight-six engine would need to be replaced by a V8 – the engine configuration of choice on the other side of the Atlantic. So, he used this as a bargaining tool to convince management to throw their weight behind the V8 programme. As it was, by 1966, Triumph’s V8 engine was already in its early stages of development, and it seemed the logical choice for the new car at the time. But in order to get the car onto the market within reasonable timescales, Triumph decided to introduce the car in 2.5-litre straight-six form, allowing for a careful development programme of the 2.5-litre V8, which could be phased in later. There were problems with the Stag development programme, but nothing significant enough to dissuade the company from forging ahead with it. Structural rigidity – or rather a lack of it – was causing concern for the Canley team, despite the later addition of double-skinned body panels. 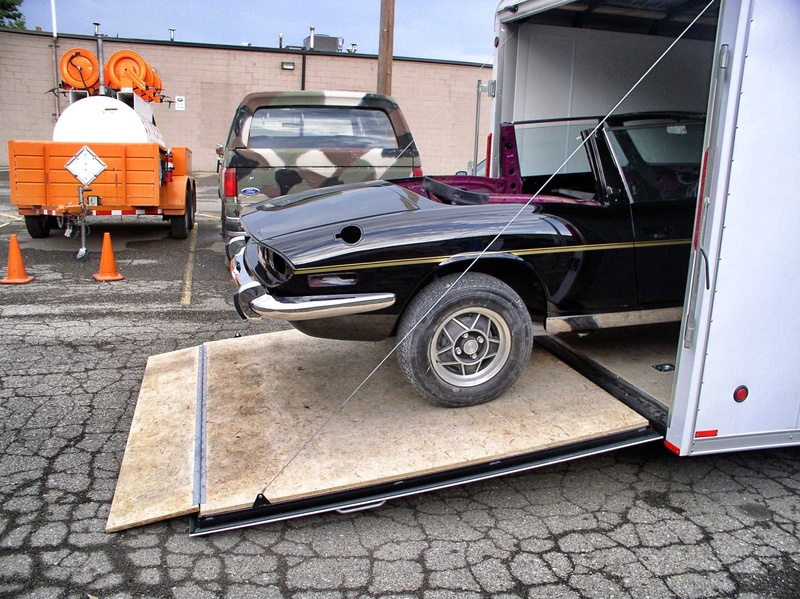 This led to the adoption of arguably the Stag’s most famous feature: the T-bar roll-over hoop. Harry Webster later recalled: ‘After Michelotti finished the prototype, we made some hand-built prototypes ourselves – and suffered from enormous scuttle-shake! Oh boy, it was horrid! You almost had to try and catch the steering wheel, if you know what I mean! During the early months of 1967 and while the development of the Stag was in full flow, Triumph was joined by arch-rival Rover in the Leyland Motor Corporation. 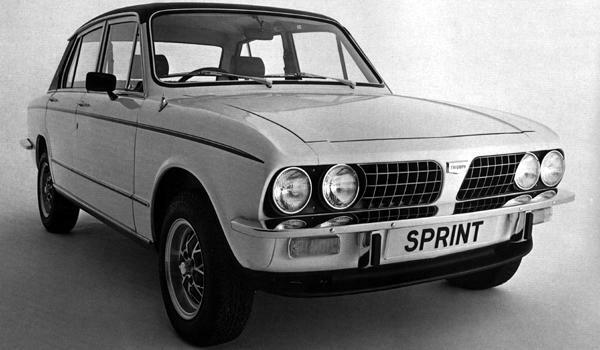 The reasoning behind this outwardly illogical purchase has been explained in The Whole Story, but the net result was that the two companies were now part of the same group – and competing models such as the Rover P6 and Triumph 2000 were now bedfellows. The ramifications of the takeover soon made themselves felt – and one main asset Rover brought to Leyland was its magnificent aluminium ex-Buick V8 engine. However, by this time, development of Triumph’s own V8 was sufficiently advanced that Triumph felt it should continue to use it in the Stag – no matter how appealing this rationalisation may have seemed. Following the formation of British Leyland in 1968, Harry Webster moved to Austin-Morris and, in his place, came Spen King. King had been working intensively on the Rover P8 when he changed camps – and one of the immediate questions coming to Triumph, was that concerning the Stag’s engine. Because of King’s intervention – his feeling was that the 2.5-litre straight-six did not have enough power, and the new V8 under development should be the car’s sole power unit. 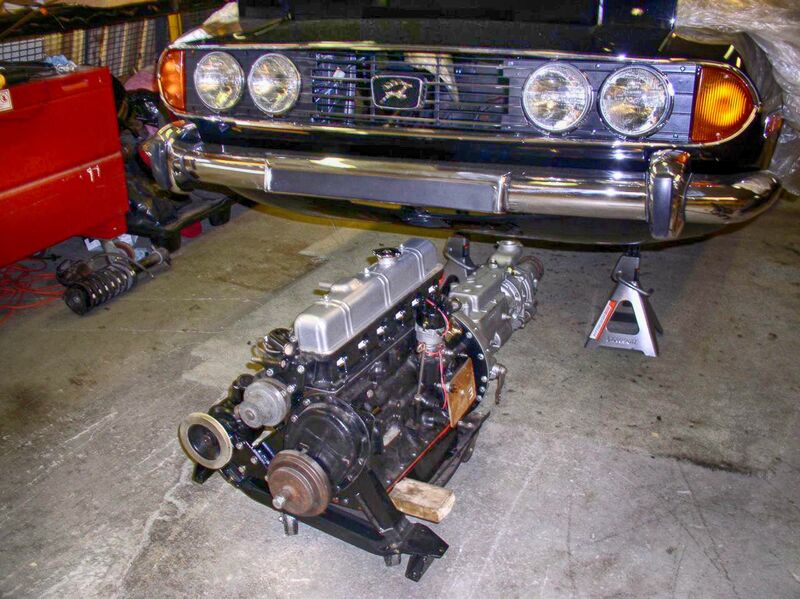 So, why didn’t the Triumph Stag get a Rover V8? The V8 had already been evolved from a 2.5- to 3.0-litre unit by this time, and where it once used fuel injection, reliability issues forced the use of a carburettor set-up instead. Certainly, it was a compact and light unit, but it was not without its fair share of problems. Without doubt, there was still a great deal of in-house rivalry between Rover and Triumph, and it is understandable that Triumph Engineers would have been less than keen to use (what they perceived as) its rival’s engine in the forthcoming flagship. However, the decision was not just based upon the pride of Triumph, but also one of production capacity. 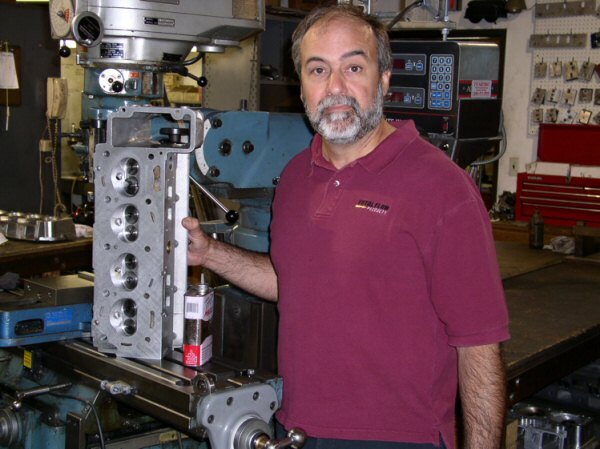 King continued: ‘…there were big investments, which had been recently made in both companies for making V8 engines. There wasn’t the capacity for stuffing them in Stags as well. If you are organized to make something, you have got to have a go at the balance between capacity for making things and what they plan (probably dead wrongly because that’s what they normally get wrong more than anything else) is planned amount of sales of any given future motor car. ‘As planned, as I remember it, there wouldn’t have been the spare capacity for V8 engines from the Rover Company to put into Stags. That was an extra thing that people forget about.’ British Leyland would ultimately pay a terrible price – because the car’s image suffered massively – for this decision. As it was, King’s decision to delay the introduction of the Stag until the V8 was ready only added to Triumph’s problems – the car’s weight went up slightly, and because there was no longer a need to use the straight-six, extensive modifications were made to the engine bay. In the end, the Stag shared precious few internal components with the car it was originally closely based upon. Wider corporate issues also beset the Stag’s development programme and, because of this, British Leyland would not stomach its launch being delayed any longer. Although many commentators have subsequently spoken of the ease in which a Rover V8 would fit into the engine bay, to do so as late as 1968 would have undoubtedly meant the launch date of the Stag would have slipped even further back. As it was, Rover and Triumph’s model programmes were already being put under minute scrutiny – and that sense of rivalry was being fuelled by the fact that both Solihull and Canley knew there would need to be future rationalisation. And that would inevitably be to the cost of one or the other. 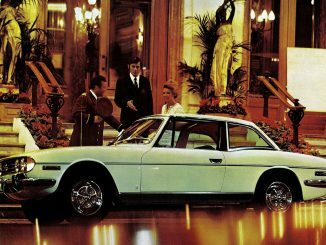 The Stag was launched in June 1970 and immediately created a favourable impression with buyers, who were quite literally enamoured by its simple beauty and its gorgeous engine note with accompanying exhaust ‘woofle’. Performance was adequate – its 2997cc engine certainly did everything asked of it and the 145bhp maximum power output compared favourably with the 143bhp from the 3528cc Rover unit. Sales started briskly and the effect on the Triumph range as a whole was marked – the uplift in image was there for all to see… The press weren’t quite so impressed. Motor Sport magazine’s Editor, William Boddy, wasn’t particularly enamoured the the Stag, though, addressing his first drive of the car as an open telegram to Lord Stokes. ‘Although the Stag is outpaced by almost all the comparable GT cars such as the Ford Capri 3000 GT, Reliant Scimitar GTE, Citroen SM and Alfa Romeo 1750 GTV, it somehow feels faster than it is and decently disposes, smoothly and quickly, of the slower-moving traffic. Boddy concluded in his passionate piece: ‘I tried to like this Triumph Stag, but it needs better steering, a better gearbox, and more poke — like Eartha Kitt’s Englishman, the Stag takes time to get going. 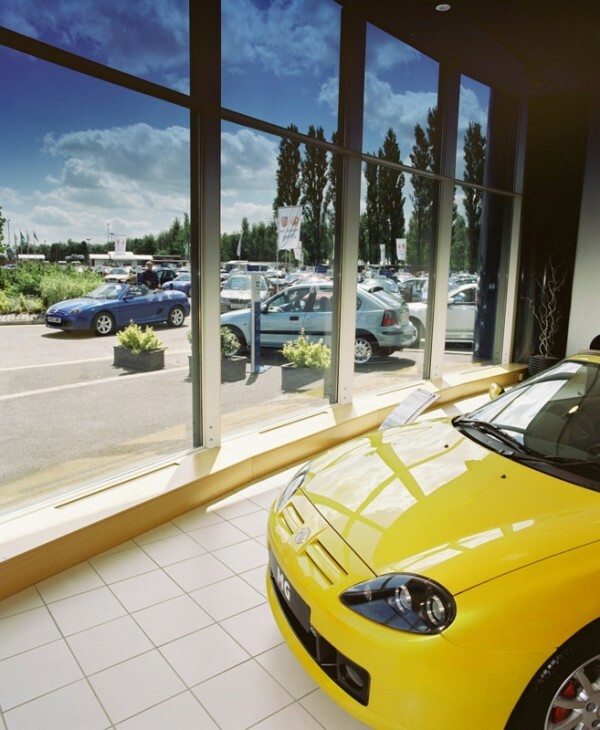 The honeymoon period with buyer didn’t last that long either, and those who plumped for a new Stag in 1970 soon found themselves falling out of love with the appealing new car. 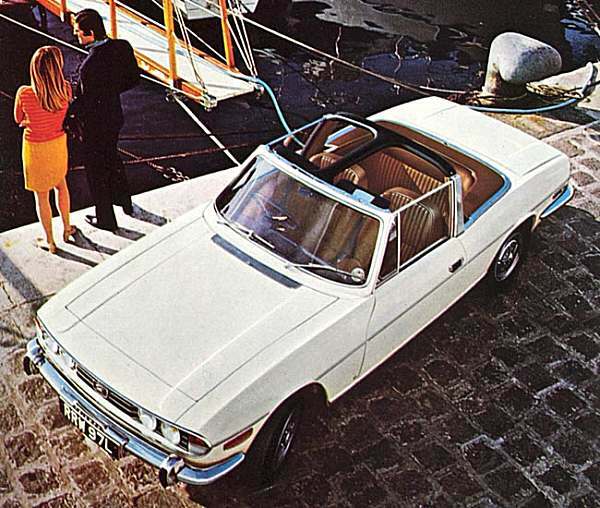 Despite its grand ambitions for the Stag, Triumph was finding it difficult to get the quality right on – and the situation wasn’t helped by the dispersed nature of its production (bodies produced at Speke in Liverpool, and final assembly in Canley). Tales of build issues and reliability niggles soon started doing the rounds and, as quickly as BL put one thing right, it seemed another problem would emerge. However, if minor fit and finish problems irritated owners, they were nothing compared with the tales of woe that would emerge about the brand new engine. Although Spen King told us there were few engine problems in development, this certainly proved not to be the case when it came to production versions. According to Stag specialists today, inherent problems were aplenty. The excessively long single-link timing chains suffered from poor tensioning – and to avoid expensive failures, they needed replacing every 25,000 miles – which would certainly seem to be a design fault. Given the laid-back and pleasantly long-legged nature of the Stag, it comes as no surprise that most owners opted for the Borg-Warner three-speed automatic transmission. Its smooth-shifting nature really suited the car – and did a far better job of cog-swapping than the manual ‘box, which was a derivative of the ancient Triumph TR2 gearbox. Thankfully, the Stag was offered with the option of overdrive, and that made for relaxed high speed cruising. Once it became clear that BL was in a financial pickle, and needed to be bailed out by the Government in 1974, the Stag’s production development became a low-priority issue – and it is for this reason that it didn’t really change much during its seven-year production run. Two models were produced, the MkI (1970–3) and MkII (1973–7), but there are very few differences between the cars. In the end, a mere 25,877 Stags were produced between 1970 and 1977. The Stag died simply because there was no money in BL’s kitty to put it right – and a car which used a unique engine and which accounted for so few sales was a luxury a company fighting for survival could not afford. When it quietly slipped into obscurity, the Stag was mourned by few – but, within the space of a few short years, it picked up a cult following, and remains today the doyen of classic British cars – and lines up alongside the MGB and Morris Minor as the most iconic classics of the time. That might account for the Stag’s amazingly high survival rate.